More than two dozen students and faculty at Cedar Hill Collegiate High School required medical treatment Wednesday after being "overcome" by natural gas flowing from an open Bunsen burner, officials say. 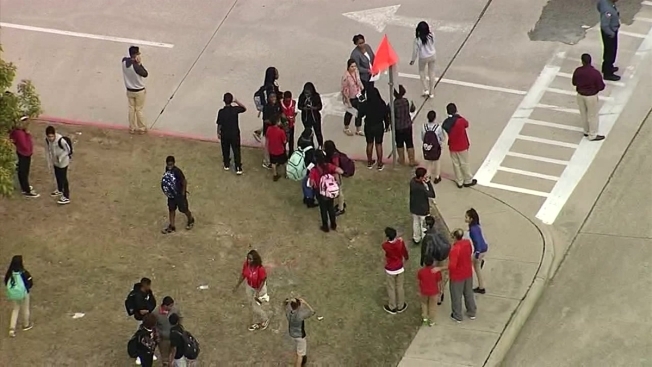 Cedar Hill officials confirmed 25 students and three staff members were affected by the gas at about 1:12 p.m. Seven of those, six students and one adult, were transported to Methodist Charlton Medical Center for treatment. The school, which is located on the 1500 block of High Pointe Lane, was evacuated a short time after the initial call. Officials said the classroom filled with gas when a valve on a Bunsen burner on a teacher's desk was accidentally left open. The gas is used to heat the burner for science experiments. Atmos Energy is inspecting the entire school as a precaution to verify there is no other open source of natural gas. The campus is home to both Cedar Hill Collegiate High School and Cedar Hill Collegiate Academy. CHCHS opened in 2008 and is home to 406 students in grades 9 through 12. Cedar Hill Collegiate Academy has 207 students enrolled in grades 6 and 7. Through a partnership with Cedar Valley Community College, students at CHCHS are able to complete 60 hours of college credit tuition-free and earn an associate degree prior to high school graduation. NBC 5's Diana Zoga and Cody Lillich contributed to this report.